As part of the Color Me Lucky blog tour, I got to pick one of the Pantone 2017 colors and create something. Of course, I just HAD to choose the color Hazelnut. ‘Cause, well, yeah. Obvious. But I also realized I had this great rayon spandex stripe fabric (remnant from Joann’s) using a shade very similar to Hazelnut! Originally I used this fabric to make a shirt with slimming sides and it just didn’t work out as I had imagined. I was pretty bummed. So…I made a different top with the same fabric for a relaxed fit v-neck raglan and I love it. It’s just right for me. The stripe print is sporty, but the drape, feel, and the color combination of the fabric is more delicate. And so soft! Combining the Hazelnut neutral and the black neutral together gives me this feeling of understated sophistication. I can’t quite stick my finger on it, but putting the two together really appeals to me. The raglan pattern is newly released from Bella Sunshine Designs. (and yes, I helped test the pattern). True to BSD’s vintage/modern style, the Ladies Reagan Raglan has a touch of vintage through that v neckline. And this time, that vintage flair is just right for me without any modifications. I LOVE where the ‘v’ neck hits on me. The shirt isn’t showing cleavage, but is interesting. The fit isn’t baggy but also doesn’t hug my non-flat belly. (The Rayon Spandex has more drape than a cotton lycra and gives a more relaxed fit.) And, this shirt fits around my bust with very minimal wrinkles. That’s total win from a fitting perspective. During the day I feel cute and put together without having to try really hard (’cause I generally only do my hair and makeup on Sunday or when I’m taking pictures. Just keeping it real…so that makes a shirt I feel cute in even better.) But honestly, I like wearing this short to bed too. It’s comfortable and drapey, soft and relaxed, sporty and yet girly at the same time. It’s not fussy and that fits my every day style very well. Can you tell I feel good in this shirt? And now some good news for you. Bella Sunshine Designs is celebrating 2 years of designing! You can get the new women’s Reagan Raglan for FREE (with coupon code)by joining their facebook group. 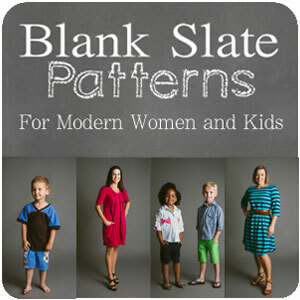 Plus there is a matching pattern for girls you can also get for FREE! AND all BSD patterns are 40% off until March 5, 2017? Pretty nice birthday celebration, huh? This is a great time to try out BSD with some free patterns and then pick up some other patterns on sale if you like what you get! That being said, if you want to take advantage of the sale and are looking for pattern recommendations, some of my favorite BSD creations are this Alice dress, Gabriella Winter Coat , and Adaline Dress. And back to the Color Me Lucky Blog Tour. Each week day a new blog will post about the Pantone 2017 colors. They are all listed below for your convenience… 🙂 Each link will only become active on the date listed to the left. Hope you get inspired! I love the play on words and your color choice. It really does look sophisticated paired with the black. And of course, I do so love a good raglan!